User motivation is becoming a critical business strategy. From healthcare to financial services, brands are looking at the mechanics of their user experience for ways to increase "stickiness". But engagement goes beyond just getting their attention. To be effective brands must capture and deepen a user's interests and expectations over and over again. To do this requires an understanding of user engagement over time and a focus on what motivates users. User motivation is both a short term and a long term phenomenon. It is also externally and internally enforced. Good user engagement starts with understanding the variables that lead to abandonment, poor user adoption and customer attrition over time. In this seminar we will walk you through the User Engagement roadmap, a toolkit we have developed to help you initiate, manage and optimize for highly engaging user experiences. Many companies have looked to gamification or game design to enhance and sustain good user engagement and user satisfaction. We will review the latest gamification tactics including results from a several studies we have conducted on gamification in healthcare. 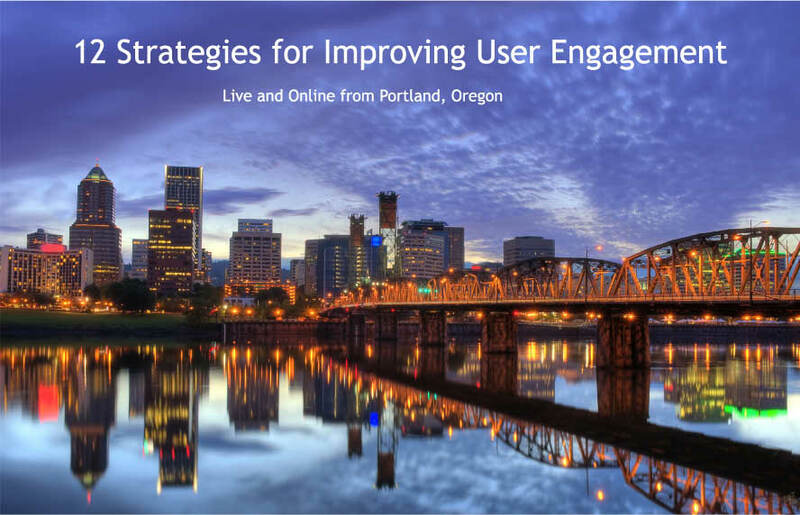 We will discuss tested strategies for enhancing user engagement, social engagement and user motivation. If you are a community or engagement manager, designer or marketer and want to better understand user engagement, this seminar will give you a practical tool to develop or rework your user onboarding or engagement strategies.